Today we wrap up this journey through Crawford County with a stop at Pymatuning State Park to dispose of bread in the ultimate way, to take in a sunset, and to see some awesome wildlife. No visit to Conneaut Lake Park is complete without taking the 10 minute drive to Linesville to visit the Spillway and Pymatuning State Park. The centerpiece of Pymatuning State Park is the nearly Pymatuning Reservoir, also known as Pymatuning Lake. The reservoir is the largest lake in Pennsylvania by surface area at nearly 27 square miles. While the lake crosses over the Ohio state line, I consider this lake to be Pennsylvania's because of its history and the fact that the majority of it is located in Pennsylvania. It was built by the commonwealth as a result of devastating floods, and as with many of these flood control projects, it has taken on an even larger purpose in becoming an ecosystem for many species, and a recreational attraction. Pymatuning Reservoir is a fantastic place to take in a sunset. We have some time until sunset, so we will feed the fish and the ducks at the Linesville Spillway, "Where the ducks walk on the fish." Thousands, if not tens of thousands, of carp, catfish, and other fish species hang out at the spillway, a place where the carp of the Shenango River ended up getting impounded when the dam was built. Visiting this place for feeding the fish became a popular roadside destination, especially during the hard times of the Great Depression, when folks had little money to spare. Feeding wildlife became a popular activity then, and feeding the fish and ducks at the Linesville Spillway remained a popular activity that attracts many people on a daily basis. This is the only place in Pennsylvania where it is legal to feed wildlife. You can read more about the history of the spillway, and directions on how to visit it, through our page on this awesome place. Looking away from the Spillway, you get an awesome view looking west. The other side of the causeway and dam is a popular place for anglers. And a little crew of playful bunnies! Now for a little hike! There are a number of small trails throughout the area. It lead us to this spectacular view. As the sun was setting, you could see a number of very large fish jumping off on the horizon. These fish had to measure in at 20-25 inches. Between the wildlife, the ripples in the lake, and the spectacular sunset, we were completely at ease. Such a great place. And set! I thought this would be the most spectacular thing that we would see that night. But then we saw another bunny! Just kidding, but definitely cute. We saw this stunning blue heron, fishing for some dinner! "I think I see something"
"It is going to happen now!" "I can't be coming up empty again! After sunset, we did a little driving down the shoreline of the lake, and crossed the two mile long causeway across the widest portion of the reservoir. 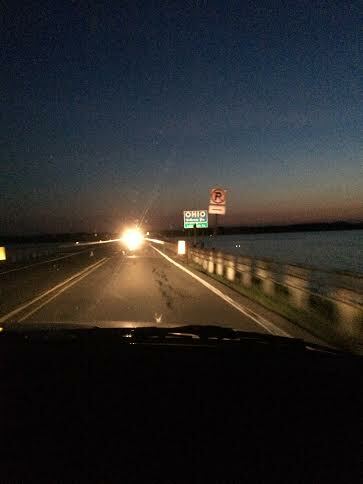 There is a bridge in the middle of the causeway that ensures that the two sides of the reservoir are connected. The border between the two states goes through this giant lake. The 26.7 square miles of lake area provide a tremendous and vast expanse of area to enjoy the lake. Fishing, wildlife viewing, feeding the fish at the spillway, sailboating, boating, kayaking, and more, are very popular recreational opportunities at the state park. Conneaut Lake, Pennsylvania's largest natural lake is located nearby and is home to a fine and affordable amusement park. We highly recommend visiting this area for a great and relaxing time in nature.